“Dingdong” my door bell rang. A good size parcel arrived by DHL. “DHL from Italy? ” the label said. who doesn’t love surprises? I always love it especially when it’s in a box delivered by some stranger. I picked up a broken scissors at arm’s length and opened the box. 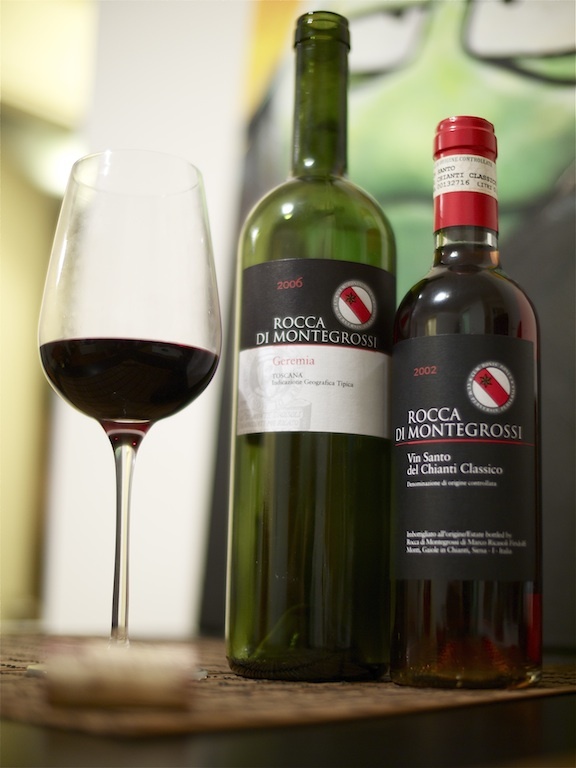 “Rocca di Montegrossi!” I said it with a big grin. 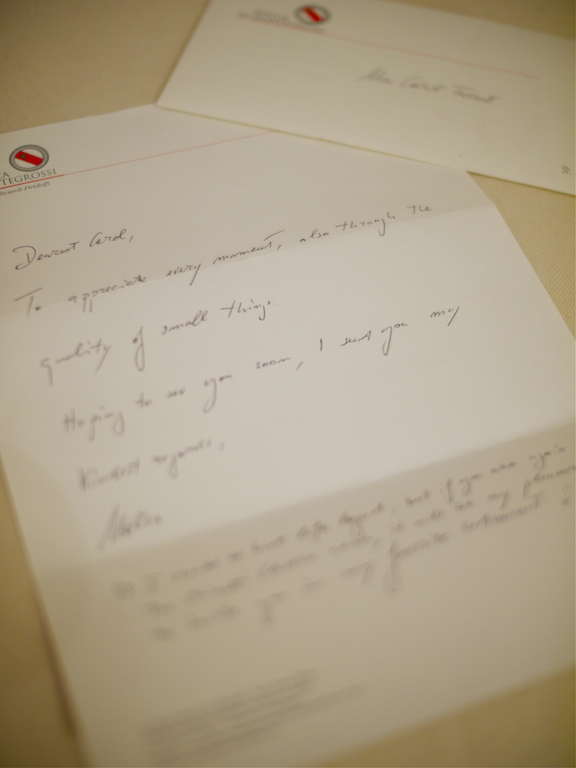 There was a letter, it’s from Marco Ricasoli. Owner and wine maker of this amazing tuscany wine. and next to the letter Is two bottles of wine I missed for a while. The wine definitely made my night. what’s next? His Vin Santo, yum! is obtained solely from white Malvasia del Chianti grapes, which are well suited to making a dessert wine as they are rich in aromatic elements, have the correct thickness of skins, and a propensity to oxidize. The bunches are dried on mobile frames placed in airy attics. During this phase, the grapes are attacked by the noble rot (Botrytis cinerea) which gives them the flavours and perfumes that are desirable in sweet Vin Santowine. The racks’ mobility is important because it permits rapid removal of deteriorating fruit in all parts of the attic. This selection is carried out every ten days until the grapes are ready to be pressed – usually in the February following the harvest. After the months of drying out, the grapes are highly concentrated and their sugar levels high. The grapes receive an extremely soft pressing. After pressing, the must is sealed in caratelli (small barrels) of 50 to 100 litres (13-26 gallons)made from different woods, including cherry, oak, and mulberry. The wine is fermented andmatures for 6 to 7 years in the vinsantaia, a room under the rafters that is exposed to the rise and fall of the year’s temperatures. After aging, the Vin Santo shows a brilliant golden yellow colour tending to amber. The aromas are intense and complex, while the flavour is warm and full, and extremely persistent. It also offers appealing scents of apricots, dried figs and toasted almonds. Excellent as a sipping wine or with desserts, such as dry pastries. However, it also complements aged cheeses and foie gras.